Habitat : Cultivated in plains and low hills. Uses : Vetiver root is cooling, refrigerent, diuretic, stimulant and tonic. Benzoin presnt in the roots helps in curing headaces. Vetiver il is very usefull in skin healing, this oil repels insects and reduces stress and tension. It is rich, earthy,woody and sweet. Vetiver oil is used extensively in perfumery for its fixative effects and its fragrance. 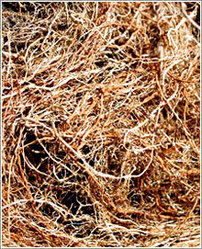 Vetiver roots are used to make brushes for natural cleansing of the body, utensils and applying aroma oils. The aromatic roots are used in potpourri and perfumes. Leaves are used in rheumatism, lumbago and sprain.